My wife and I took our three-year old twins to see a local school’s production of The Sound of Music. It was pretty good. Because I’m currently seeking God’s guidance in searching for a new job a particular line from the musical stood out to me this time around. It’s a famous quote: Maria says “When the Lord closes a door, somewhere he opens a window.” It’s a nice sentiment (not precisely biblical), but what does it mean? Sure I understand the general concept that sometimes we think we’re out of options but God may have other plans and we just need to look to Him. But why would God open a window? Maybe my brain works differently (I’m avoiding the word “abnormal” here), but I used to think that this meant God opens a window so you can climb out another way. And I thought, well that’s dumb, he should open another door, not a window, unless he intentionally wants to make it harder to get out. But now I’m considering some alternative interpretations, or should I say reflections. Perhaps God’s intention in closing the door and forcing you out a window is not to make it harder to get out of whatever room (or predicament) you’re in. Perhaps God is opening a window so you can still see the place you thought you were headed, and even breath in some of the air from out there, but He actually intends for you to stay right where you’re at. You were so sure you were supposed to exit that when God shuts the door you’re still looking for a way out when God really wants you to stay right there. Perhaps He opens a window in order for you to see what’s going to happen out there where you would have been – to see that in the end it would have been a bad decision to go out the door and God was sparing you. Or perhaps He’s opening the window in order for you to still get some sunlight and fresh air and some of the benefits you would have experienced outside while you continue in the place where He has you now. Of course this blanket statement about God always opening windows when he shuts doors is not from the Bible – it is not inspired by the Holy Spirit as the very word of God. But it’s a fun little analogy to play with and it can be used as a reminder, like we’re doing now, that even when God slams a door in your face and leaves you wondering what the heck is going on, it’s still time to praise Him. He is still worthy of praise. His character hasn’t changed; He is still faithful, still sovereign, still glorious, and He still loves you more than you can possibly imagine. Instead of climbing out the window, or sitting in front of the door with a stunned look on your face, take a seat right there on the floor, make yourself comfortable and spend some time with God. There’s no better time or place to praise the Lord than wherever you are. 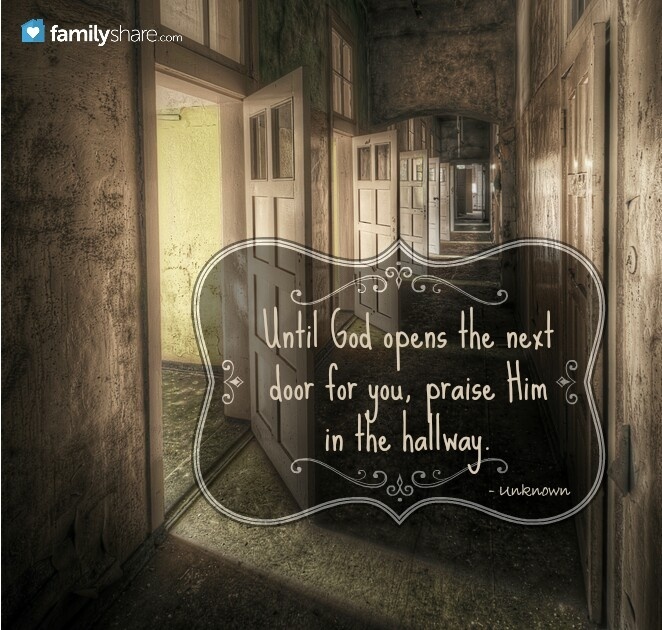 Until God opens the next door, praise Him in the hallway. Hallways are a necissity it seems. A place no one really wants to spend time, but until you know which door to open, it is a place to ponder the possiblities.